Kimberly Beattie and Charmander. Photo by Ric Shaffer Photography. Gladstone, N.J. – Aug. 19, 2017 –It was Manhattan Saddlery Family Day at Monmouth at the Team and the jumper divisions continued in the main ring at Hamilton Farm, with the two featured classes closing out the day: the $2,500 Low Children’s/Adult Jumper Classic, sponsored by ZEUS Scientific, and the $5,000 Marshall & Sterling NAL/WIHS Children’s/Adult Classic, sponsored by Manhattan Saddlery. Skip Bailey’s courses were both challenging and appropriate, testing the skills of the horses and riders. Out of 36 horse-and-rider combinations in the $5,000 Children’s/Adult Classic, sponsored by Manhattan Saddlery, 11 progressed to the jump-off round. Kimberly Beattie and her own Charmander were 25th in the order. They opted to stay in the ring to take their jump-off round and nailed a screaming fast trip of 29.273 seconds. That became the time to beat. Taylor Kraft and Cosmopolite S, a bay Swedish Warmblood by Cardento owned by Kirk Webby and Peter Kraft, came close to catching Beattie at 29.805. Their performance put them into the second spot. Kendall Casaccio and her own Elevation 1147, a bay Oldenburg mare, put in the next closest time at 31.015. Beattie and Charmander held on to the lead and won the blue ribbon. They were also named champions of the Children’s/Adult Jumper division. “The course was challenging; there were a lot of bending lines, but everything came up just right,” Beattie said. “My horse has a huge stride, so we managed to just walk everything. Charmander is a 20-year-old Holsteiner gelding by Cassini I. He was the former partner of Ulrich Kirchhoff, and together they represented Germany in international competition. Taylor Kraft and Cosmopolite S. Photo by EQ Media. Kendall Casaccio and Elevation 1147. Photo by Ric Shaffer Photography. Earlier in the day, the $2,500 Low Children’s/Adult Jumper Classic, sponsored by ZEUS Scientific took place. First in the order, Melinda Hartman and her own Happy Feet, a 14.1 ½ -hand Welsh pony, blazed through their jump-off round. Each of the 18 other horse-and-rider combinations tried to best their time but Hartman and her pony were unbeatable. Melinda Hartman. Photo by EQ Media. Hartman and Happy Feet have been together for eight years. “My pony is absolutely amazing,” she said. “We got her on a whim, she jumps great, and she took great care of me when I was little. She ended up doing the pony jumpers, and she was on the bronze medal team in 2015 at Pony Finals, and she got seventh in the farewell only because we got a time fault. 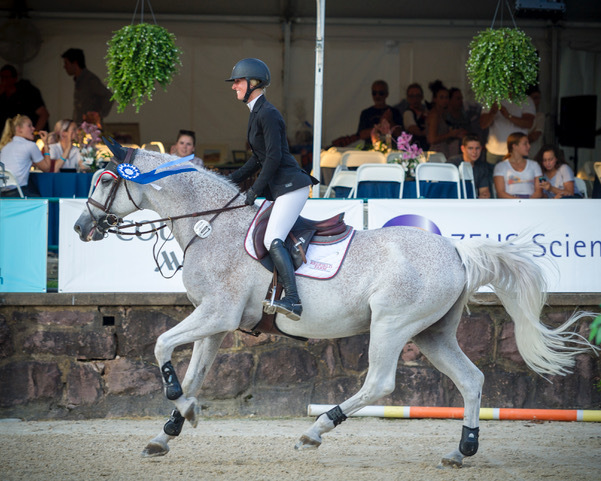 She’s 19, and she loves this division and she won everything last year." After the conclusion of the $2,500 Low Children’s/Adult Jumper Classic, sponsored by ZEUS Scientific, special awards were presented. Michael Desiderio received Friday's Style of Riding award, sponsored by Le Fash. Libby Shea Dayton earned the award for Saturday. Le Fash is an equestrian apparel line that offers high-quality equestrian apparel that can go from stable to street. Boost your equestrian style and shop online at lefashny.com. Stal de Eyckenhoeve sponsors the Top Trip of the Day award. The judges selected Gigi Monihan and Pebbles IV and Diana Patterson and Estrada Empire for the honor. Based in Geel, Belgium, Stal de Eyckenhoeve is an exporter of fine sport horses for equitation, hunters and jumpers. Learn more at stal-de-eyckenhoeve.be. Saturday was Manhattan Saddlery Family Day and riders, family and friends gathered at the Manhattan Saddlery booth in the afternoon to enjoy ice cream and lemon ice. Manhattan Saddlery scooped up ice cream during Manhattan Saddlery Family Day. Manhattan Saddlery is New York City’s only equestrian tack, supplies and apparel shop. Providing expert service from friendly staff, they proudly stock some of the most beloved and stylish brands. Manhattan Saddlery serves as a hub for horse lovers in New York City. Stop by their booth at Monmouth at the Team and visit their knowledgeable staff in their riders’ lounge. Go to manhattansaddlery.com to learn more. ZEUS Scientific produces clinical diagnostic solutions that they manufacture and develop to ensure optimal efficiency, accurate diagnosis, and better patient care. ZEUS Scientific partners with industry leaders to create integrated, innovative solutions that reduce diagnostic test turnaround times and increase laboratory efficiency. For more information, go to zeusscientific.com. Monmouth at the Team concludes Sunday with the final day of exciting jumper competition featuring the $2,500 NAL Junior/Amateur-Owner Jumper Classic and the highly-anticipated event of the day, the $10,000 Mini Prix, sponsored by Horseflight. Horseflight is the leader in equine global air transport. Horseflight makes equine transport easy for you. Learn more about Horseflight at horseflight.com. Elizabeth Ehrlich from Equine Elixirs and B.J. Ehrhardt from Foxhedge Farm. Ulceraser provides equine gastric support and ulcer prevention. Its all-natural proprietary blend of ingredients forms a roughage that tastes so good, even the pickiest eaters love it. Equine Elixirs is produced in the U.S. It is 100 percent compliant with US Equestrian and FEI and contains no prohibited substances.